Bixler’s Elixir 3 Step Inflatable Boat Deep Cleaning and Restoration Kit. Clean and revitalize your old Zodiac, Avon and Achiiles inflatable. Our kit includes one quart of cleaner, 8 oz of our mild abrasive deep cleaner, 16 oz of our UV protectant and sealer, two 16″x16″ reusable Microfiber cleaning cloths and one 6″x4.5″ non abrasive cleaning pad. Remove years of oxidation. Protects and restores in 3 easy steps. Bixler’s inflatable boat cleaner is a superior cleaner for all inflatable boat fabrics and surfaces including fiberglass. Our exclusive formula is a fast acting detergent that quickly removes stains, dirt, grime and oil with ease. Surfaces stay clean, bright and film free longer. Rinsing is optional. Our Inflatable Boat Deep Cleanser is an intense, deep cleaner with a mild, safe abrasive to remove years of severe oxidation, mildew and deep stains with ease. Our exclusive sealant and formula restores color and shine and provides surface and UV protection. Safe for all PVC, Hypalon and Polyurethane fabrics. This safe yet deep penetrating surface protectant will also prevent future oxidation and fading . It also makes future clean up easier as the pores are sealed so the dirt does not penetrate as easily. 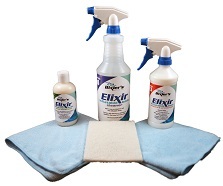 We recommend you use the sealant as the final step of the Bixler’s 3 step cleaning process. See related products below for non abrasive scrub pads. Don't let your inflatable get sunburned!! Our exclusive polish & protectant formula restores color and shine and provides surface and UV protection.